2013: Creative Pay it Forward: The first five people to comment on this post will receive a gift from me sometime this calender year! The catch is you must make the same offer on your own page (blog, Facebook, Twitter or Haynet) - I'll be checking! Offer applies worldwide - I will post anywhere! Anyway, let's have some craic with this! What a lovely idea :-) I like the idea of something handmade - maybe a photo in a card frame or something? Hmmm. Putting my thinking cap on and will post this forward when I get 5 ideas! Count me in. Will post similar offer next week. Will have to ponder what to give for rewards. Wheee. I'll play! 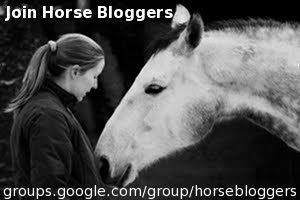 I didn't want to do thus when it went around Facebook, but it would be fun with my equine blogger friends! Oooh.... Seven commenters.... Thank goodness, I was afraid I'd be left sitting here looking very embarrassed! We've got a whole year to come up with ideas so don't panic about having inspiration before you repost, Kayti! Martine, what a clever idea!